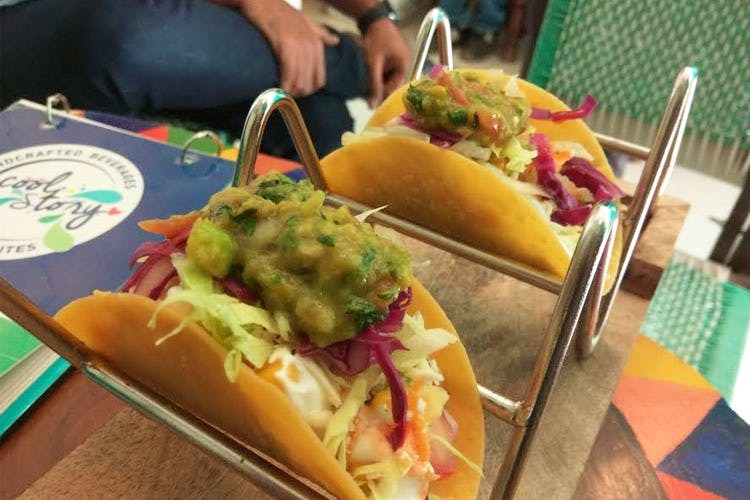 We love the food at Mexican Express in Bandra; and here’s what we ordered. After a long tiring day of shopping, bargaining and shopping again on those thrifty posh lanes of Bandra, we just want to just sit down at a place and have a quick meal without wasting too much time or money. And KFC is just too full and McDonald’s is so passé? Then, we check out this small little joint, Mexican Express, that has opened up in the lane opposite Poetry by Love and Cheesecake. A two-month-old QSR place, Mexican Express serves authentic vegetarian Mexican food. So, we get quesadillas, tacos and burritos along with their house made churros and nutella quesadillas. The entire concept of Mexican Express is that they don’t really want you to go through a large menu filled with plenty of food options that you might have never heard of. It’s one of those places where you just hop in, order one of their specialties, devour their affordable and filling food and make a quick head-out with a happy tummy. We fell in love with their nutella quesadillas, the warm and fresh burritos and the churros. The best part, in INR 500 or less, you can have a filling meal of their freshly prepared, mouth-watering food. Need we say anything more that nutella quesadillas?